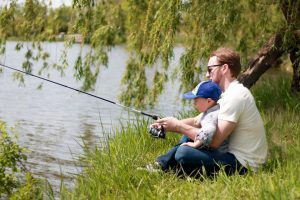 West Suburban Bass Anglers Club returns to Plum Grove Reservoir, located on Algonquin Road near Harper College, with the annual Fishing Derby on Saturday, June 3 from 8:00am to 12:00pm. Join friends and family for a morning of catch and release fishing fun for all ages. Event will include contests for largest fish, most fish, and a variety of prizes including a 50/50 raffle. Fish in the Plum Grove Reservoir include Hybrid Sunfish, Bass, Channel Catfish, Perch, Carp, Bullhead, and Northern. Prizes will be awarded for various categories in each age group: 0-10, 11-16, and 17+. Prizes will include largest Bass, largest Catfish, largest Northern, and the largest fish in the “other” category. West Suburban Bass Anglers Club will be on hand to help weigh fish and assist with any fishing needs. Raffles will be held throughout the event. Bait and food will be available for purchase. Event registration will be $5.00 for all ages payable in cash only on the day of the event beginning at 7:00am. All participants age 16 and over must provide proof of fishing license. Licenses can be purchased online through the Illinois Department of Natural Resources at dnr.illinois.gov or locally at the Salmon Shop, 111 South Northwest Highway, in Palatine. If you are new to fishing or would like to learn more, members of the West Suburban Bass Anglers Club will be offering a free instructional fishing class on Friday, June 2 from 5:30pm until 6:30pm. Participants will be instructed in the proper method of setting a hook, reeling in a fish, properly releasing a fish, and a wide range of other topics. Participants need to bring their own rod, reel, and tackle, but bait will be provided. After class, participants will get the opportunity to fish with help from the instructor. While this class is free, pre-registration is required using program code 204310-01. Register in person at Birchwood Recreation Center, Community Center, Falcon Park Recreation Center, or online. For more information about Fishing Derby, contact Athletic Coordinator Todd Ranum at tranum@palatineparks.org or 847.496.6238.